I questioned if I wanted to do this post or even mention the issue, I'll admit. If you followed along on Instagram and social media (read here to catch up), Kat Von D recently held a makeup contest for this relaunch. And the person who won did a great job, but politics were brought into it from Kat's side. For me, this isn't about who is right or wrong on the political side of things. I just don't think politics should be brought into a MAKEUP contest. A makeup artist won because of makeup skills and that should have been that. And even if it were the MUA's choice not to attend the party after Kat's messages, I still believe she should have received her prize package for winning. But I am posting this, because there are two sides to every story. I don't look at the brand the same way and that happens sometimes. It's not that I agree or disagree with either side, it's that I don't think it should have come down to sides in this particular matter. If both are adults, then both should be able to handle a difference of opinions and focus on the main topic at hand in this case- makeup and fragrance. Maybe next time, Kat should add a disclaimer to her contest that states that you can't disagree with her and must tell her which political party you vote for or she'll slide into your DMs and you won't win. I'm sure plenty disagree with me on politics coming into play in this and that is okay. Like two sides to the story above, these fragrances are marketed as "There are two sides in all of us.Which one will you choose?" Saint or Sinner? I missed when these two were out before, so both of these scents are new to me. Let's see which one I choose! I prefer this one to Sinner. It's the lighter of the two and easy to wear during the day. I like scents with vanilla and musk, which this along with Jasmine. 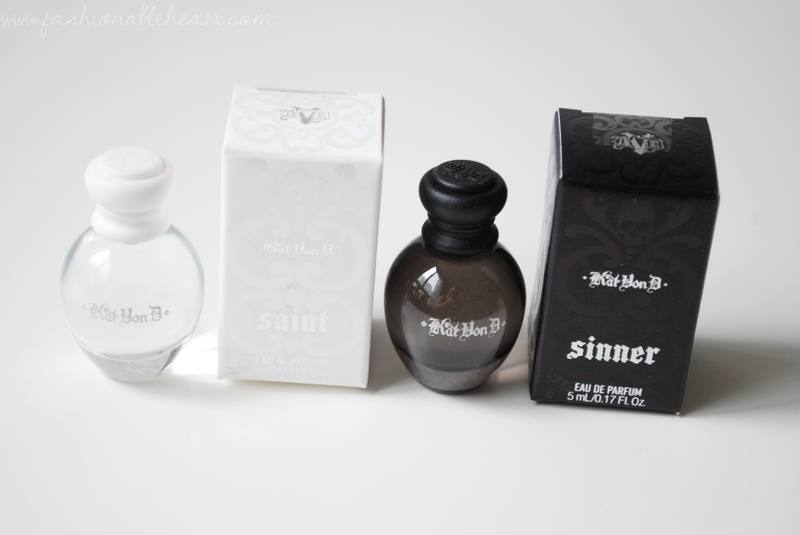 I like it alone, but it can be paired with Sinner for a layered floral scent. Obviously these are sample sizes, so the bottles and rollerball look entirely different. I think this is the type of scent that a lot of people would like, because it isn't complex and it's fresh. Sinner is warmer in fragrance. With patchouli, wood, and cinnamon being the top notes, it takes on a spicy scent. Those aren't often the ones I'm attracted to, so I don't love this one. I reach for it more during the evening hours, but it's not one that I really enjoy for all day wear. Fall and winter months might change my mind, because I find I like warmer scents then. 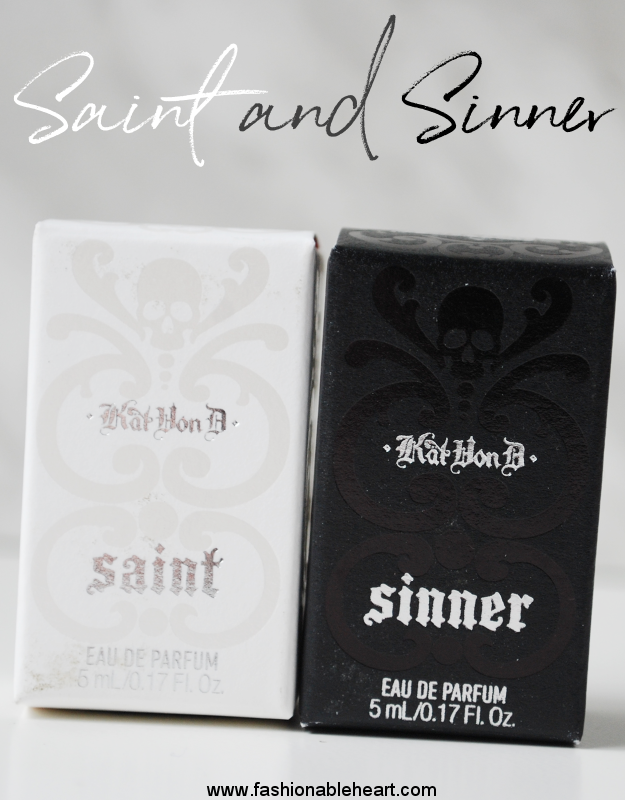 I think they do work well together, but if you prefer light and fresh scents then Saint is for you and if you prefer spicy and warm scents then Sinner is the winner. So which one are you or are you both? **These were sent to me for reviewing and testing purposes c/o Influenster. All pictures and thoughts are my own.